"This is just an idea... can we think of a gold exchange where there can be transparent trading. A platform where those who have surplus gold can sell it to those in requirement," Shaktikanta Das, Secretary Department of Economic Affairs Ministry of Finance said. While the maiden sovereign bond scheme has been a success, the demand for paper gold coming in at Rs 246 crore, the monetisation scheme has been a big flop with only under 500 grams worth of jewellery being monetised. 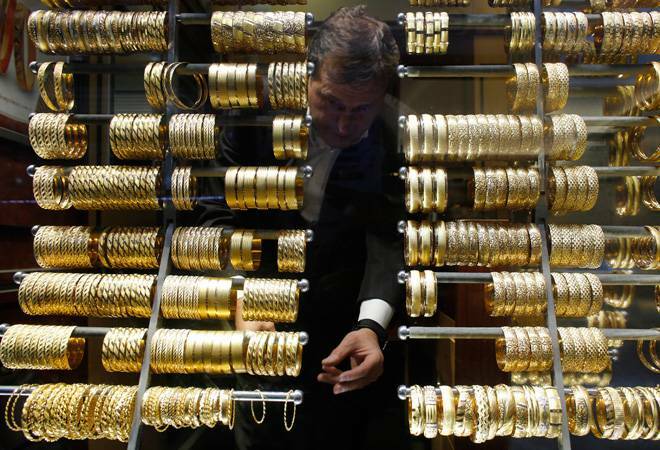 The government on Tuesday floated an idea of a gold exchange, a transparent platform where jewellers can buy and sell the precious metal locally instead of depending on the international market. "There is a jeweller who needs gold temporarily, so instead of importing he can buy it locally," Das said addressing the third India International Bullion Summit organised by Indian Bullion & Jewellery Association in Mumbai. On the recently launched gold monetisation scheme , he said, "It is too early to give a verdict... and the government is committed to make a success of the scheme. It is not easy to convince people to part with their jewellery, which has emotional value attached to it. We need to change this mindset and understand the psyche of the people," Das added. Asking the industry to give suggestion to make this scheme a success, he said, "there are huge challenges and there is a need to involve a lot of jewellers, who can talk to their traditional customers and bring them into the gold monetisation scheme." He informed the Bureau of Indian Standards (BIS) has invited applications from over 13,000 licenced jewellers to act as a Collection and Purity Testing Centres (CPTCs) in the scheme, provided they have a tie-up with BIS licenced refiners. Early November, the Centre launched two gold schemes, sovereign gold bond and gold monetisation, with a view to contain bullion imports, which have been a big drain on the foreign exchange reserves. These schemes were aimed at bringing down the physical demand for gold or jewellery. About the Gold Bond, he said, 63,000 applications amounting to Rs 246 crore have been received. "This scheme saw an overwhelming response from investors throughout the country and initial figures show that about 63,000 applications were received for a total of Rs 246.20 crore by banks and post offices for 917 kg of gold. We expect even better response in the second tranche of the scheme," he added. On economic growth, Das said overall, the growth is expected to be in the vicinity of 7.5 per cent in 2015-16. IBJA president Mohit Khamboj urged the Centre to create a dedicated gold bank for the sector that will boost the industry. However, Das said, a dedicated bank of a particular sector is not an feasible idea. JK Dadoo, Additional Secretary and Financial Advisor, Commerce Ministry said there is 22,000 tonnes gold, valued at USD 1 trillion, lying in the country of which 90 per cent are in the temples and the religious places. "It will not be easy for them to part with the gold. However, if the Economic Affairs Ministry can talk to them and convince them to part with this yellow metal then the market will be flooded with gold and the will get 1,000 tonne gold annually. This gold can be bought by SBI and MMTC and converted into coins," he added. Former SBI Chairman OP Bhatt opined that the maturity period for the gold bond should be 10-15 years instead of the 8-10 years now to make the scheme more attractive.